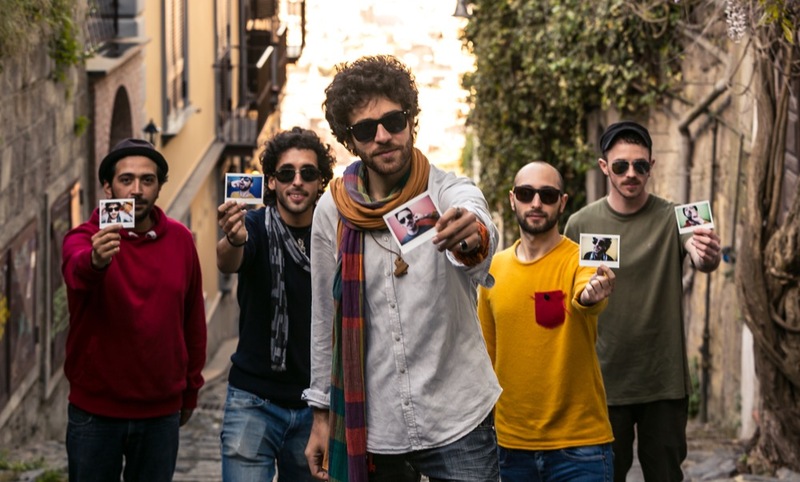 Since the release of their first album "’O vicolo ‘e l’alleria" in November 2014, La Maschera took its place in neapolitan music scene as one of the most interesting independent bands. ‘O vicolo ‘e l’alleria, published by Full Heads Label, is a trip through Nepolitan alleys, witholding characters, stories, loves, contradictions, vices, dreams and hopes. It was soon noteworthy for its remarkable experimentation rate, so that it could be fully placed in the “World music” genre. La Maschera’s music is a a successful synthesis of the varied musical background of the band’s members (Roberto Colella, voice, guitard, saxophone e keyboards; Vincenzo Capasso, trumpet; Alessandro Morlando, guitars; Antonio "Gomez" Caddeo, bass e contrabbass; Marco Salvatore, drum) from the rock of the Sixties/Seventies to the folk tradition, through the punk and ska. Confirming their attitude towards stylistic contamination, in the summer of 2015 La Maschera meets the Senegalese musician Laye Ba: their encounter resulted in stylistic contamination and musical blending. The outcome is their single Te vengo a cerca’ digitally released in April 2016, and included in La Maschera’s upcoming new album. This song carries the band through a journey to Senegal, among people from the popular neighborhood in Dakar where the song’s videoclip was shot. During their stay in Senegal La Maschera is hosted on the three main national TVs, including the broadcaster headed by the renowned musician Youssou N'Dour. At the same time La Maschera achieved several awards in Italy, such as Rete dei Festival Award 2014, La Radiazza - Giovani Suoni Award 2014, San Gennaro Day Award 2015 and the Social World Film Festival Award 2017. From their debut in the indie scene, they never stopped playing around Italy, landing on renowned stages such as the Meeting del Mare (2015), the Ecosuoni Festival (2016) and, above all, the Bellini Theater in Naples in April 2017, which recorded an almost immediate sold out. In November 2017, their second album, entitled "ParcoSofia", will be released, disclosed by the single “Dimane comm’ ajere” and its videoclip, shown to public for the first time during La Maschera’s concert in September 23th.